These two items appeared separately in the Around Naples Encyclopedia on the dates indicated and have been consolidated onto a single page here. Diplomatic Relations, US/Naples; Hammett, A. This Day in Diplomacy: Establishment of Diplomatic Relations With the Kingdom of the Two Sicilies on December 16, 1796. 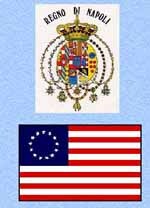 Today the city of Naples will commemorate the 200th anniversary of the establishment of diplomatic relations between the United States and the Bourbon Kingdom of the Two Sicilies of which Naples was capital. The rapid expansion of American trade in the Mediterranean basin and a growing regional instability created by the French revolution and North African piracy required an expanded diplomatic and military presence in the region by the fledgling American government. Naples, as the largest city on the Italian peninsula, was a major port of call for American merchant vessels. Moreover, the Bourbon regime still enjoyed in the last years of the 18th century its reputation as one of the pioneering reform states of the European Enlightenment. Until most of Italy was united in 1861 as the Kingdom of Italy, the United States maintained separate diplomatic and consular representatives at Naples. Continuous U.S. diplomatic representation at the court of the Two Sicilies only began in 1831, and then, in keeping with the cautious regard of American republicanism toward European monarchies, such representation was almost always a Charge d'Affaires rather than a full Minister. American commerce, however, made necessary continuous consular representation at Naples from 1796. For 52 years, from 1809 until 1861, Alexander Hammett of Maryland served continuously as American consul at Naples. During his long tenure, Hammett reported on wars, revolutions, and the expansion of U.S. trade. I was in Naples in December 1996, and I'm sure I would recall any large-scale popular celebrations of the anniversary of the establishment of relations between the USA and the Kingdom of Two Sicilies (also known as the Kingdom of Naples). There were none, not even any clandestine humming of the Bourbon Royal March. No doubt, this has to do with the fact that said kingdom went out of business in 1860. Alexander Hammett sounds like an interesting person, though. He represented the US in Naples for over half a century. The dates invite further investigation that I shall have to get around to sooner or later. If he started his tenure in 1809, that would be in the middle of the short reign of Murat, who ruled for Bonaparte during what is still called the "The Decade" in Neapolitan history. When Murat was deposed in 1814, it seems that Hammett simply stayed on as US representative. That strikes me as unusual. The first mention of relations between the new American nation and Naples is in the National Archives in Naples. A Neapolitan businessman, one Vincenzo Cutini, made a request on March 12, 1783, to be appointed Consul in the United States. That date is interesting in that it is before the Treaty of Versailles officially ended the American Revolution, meaning there really was no United States of America, yet. The King of Naples, however, decided that the time was not yet ripe and Cutini's request was turned down. Over the next two years, Thomas Jefferson, John Adams and Benjamin Franklin all actively pursued the cause of Neapolitan recognition of the US. Though diplomatic recognition did not result from any of this maneuvering, a somewhat informal period of commerce ensued. Also, in 1785 the US, concerned about danger to its merchant fleet in the Mediterranean at the hands of the Barbary pirates, requested aid, if the need should arise, from the Neapolitan fleet. By 1796, the position of the United States had consolidated and it was in that year that John Mathieu became the first American Consul in Naples. He was followed in 1806 (the year that Murat took over Naples) by Frederick Degan, who served until 1809, at which time Alexander Hammett became Consul and then Charge d'Affaires when full diplomatic relations were established in 1834. In November 1860, the US diplomatic legation was closed as the kingdom of Naples was officially annexed to the rest of Italy. Consular representation in Naples continued, but Hammett was discharged by the new Lincoln administration. One source I have read refers to him as "a gifted amateur" and another tells me that he died in the "almshouse". That would be a sad end. If he left a diary, I wonder if it is in the National Library downtown. As much as I hate to fight my way into that place, this one is tempting. I've just acquired a fascinating two-volume work entitled Diplomatic Relations Between The United States and the Kingdom of Two Sicilies by the late Howard R. Marraro, the prominent historian at Columbia University. The work contains most of the official correspondence between US diplomats in the Kingdom of Two Sicilies (also known as the Kingdom of Naples) and the various presidents of the United States between 1816 (following the defeat of Napoleon and the restoration of European monarchies) and 1861, the year of the defeat of the Kingdom and its incorporation into united Italy. [*The confiscation of US ships and property by Murat (and by Napoleon in France) is part of a long and complicated dispute between the United States, France, and Great Britain over the rights of neutral countries (the US in regards to the war between France and Britain at the time) to trade with whomever they wished. The French, however, had blockaded Britain in 1806 and declared that a neutral ship that visited a British port had lost the protection of her neutral flag and was subject to seizure. Thus, the French —and Murat in Naples— justified the seizures because the same US ships that were in French and Neapolitan ports had just visited British ports. Napoleon (and Murat) used, as an ulterior justification, the fact that US ships in French (and Neapolitan) ports had also violated America's own Embargo Act of 1807, which forbade US ships from carrying on commerce with Britain and France. President Jefferson thought that the act would show both nations how much they really needed Yankee trade. All it did was bankrupt and infuriate New England merchant firms, who openly flouted the Embargo Act. To pursue this matter further, there is an explanation of the Embargo Act of 1807. Never before had "revolution" in any country arrived at such a degree of perversity and anarchy. [Speaking of Garibaldi's decision to reward the family of a Neapolitan soldier who had tried to assassinate the King of Naples a few years earlier]...To canonize as holy the regicide, to reward publicly the assassin, to excite officially with such an example to extermination of sovereigns…Such examples speak louder than all declamations of the miserable moral state into which the Kingdom has fallen and upon the anarchy which has obtained the mastery of its destiny since the triumph of the invasion. In the introduction to this unbelievably complete book (published in 1951), Marraro acknowledges, of course, the National Archives in the United States and the State Archives of Naples. He also mentions the encouragement he received from the Neapolitan historian and philosopher, Bendetto Croce, who was anxious to have material from original sources researched and published, since many of the relevant documents that had resided in the archives in Naples had been destroyed by the Germans when they retreated from Naples in 1943. There was no strategic reason for pillaging the archives, as far as I know. Perhaps that is a thought for another day.